The cabinet refacing process only takes three to five days to complete, so you can have brand new kitchen cabinets in less than a week. What can we say? After 4 decades in the business, the Kitchen Magic crew has a streamlined refacing system that is a wonder to watch in action. Once you've signed the work order, our team kicks into gear. Click Here to watch a video outlining the steps—from the signed work-order to your finished cabinet remodel. This level of choreography takes a notable level of training and expertise—paired with a great company culture that cultivates a cohesive installation team. One of the great things about refacing your cabinets is that you can keep your existing countertop in place while we're overhauling the cabinets. NOTE: That's not the case if you're replacing cabinetry with new, custom versions as the process to remove a countertop, preserve it intact and ensure it precisely fits the new cabinet template is virtually impossible. 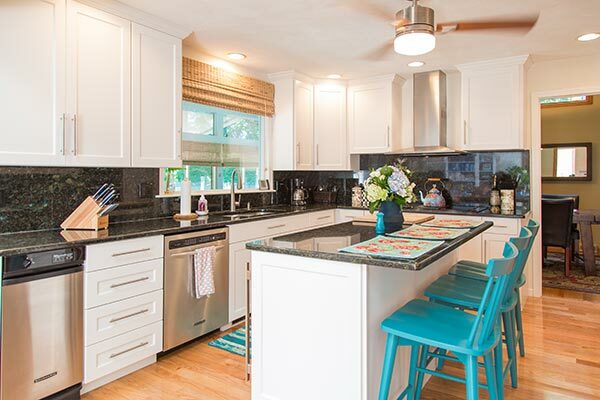 For many, the ability to keep a countertop they like, and update the cabinets in less than a week is like a dream come true, and that 3-5 day installation estimate is based on the assumption that existing countertops are staying put. Read, Can I Switch Out the Cabinets Underneath My Granite Countertop, to learn more about why the "cabinet egg" should always come before the "countertop chicken." If you want to install a new countertop to go along with your newly refaced cabinets—Kitchen Magic can make that happen, but we'll need to tack on an extra week or two (typically 7 to 10 business days) to the original "3- to 5-day" window, depending on the complexity of the countertop layout and slab availability. 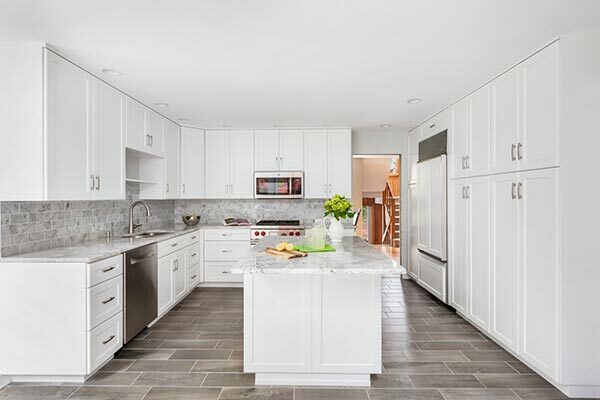 That extra time is impossible to get around because countertops can't be measured, templated, manufactured to the specifications or ordered until cabinets are set in place. The fast-track to refaced cabinets is only relevant if cabinets are the only thing you're changing. 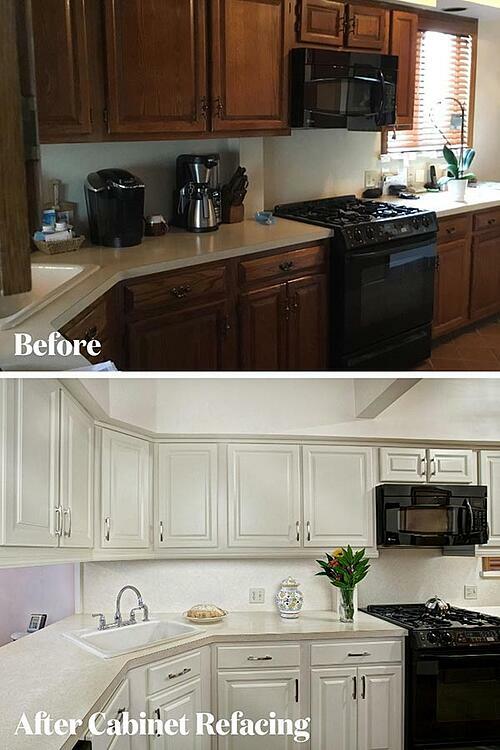 The kitchen below is an example of just that—it took 3-5 days, all we changed was the cabinets, and the transformation is nothing short of impressive. If you want to add some tile work, change the flooring and/or re-do the backsplash to create a more fluid transition between your new cabinets and the counters—we'll need more time to accomplish it all. 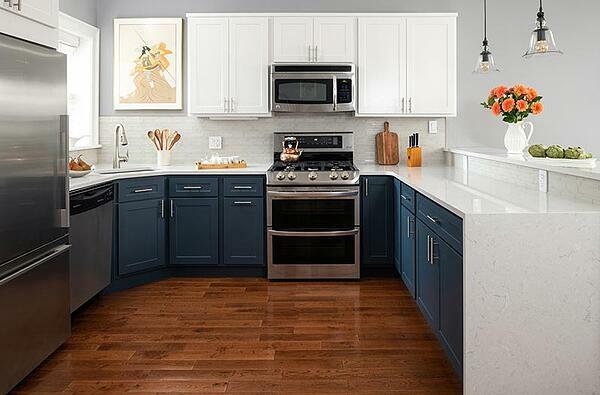 As with the new countertop example, we're happy to design and install additional tile, a new backsplash or flooring, but that adds more time to the build-out calendar. We'd like to add that if you're not planning on a complete remodel and a quick turnaround is important to you, go ahead and reface the cabinets before replacing the flooring. This is the best way to ensure you select flooring that's complimentary to the new cabinet doors and finishes—something that's more challenging when you're working in sample sizes. In a Hurry to Complete Your Remodel? 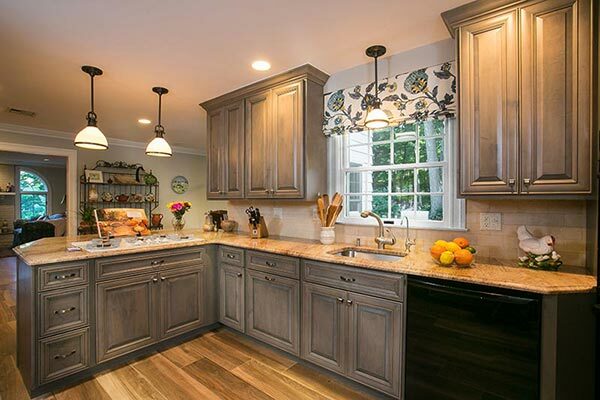 Kitchen refacing is a brilliant solution whether you're revamping the kitchen to increase resale appeal, or simply interested in a quick, affordable way to make your kitchen look like new, Schedule a free in-home consultation with Kitchen Magic to kick-start your fast-track kitchen update.